As we now have a new standard regarding size will it matter?? Got a few Lipochromes this year that appear quite large, will have to wait and see for the colour! But hopeful it will show through, just thought you maybe interested to see how they look in a showcage!! This one maybe too big lol! Re: As we now have a new standard regarding size will it matter?? sorry to deflect from topic, but what kind of show cage is that? Its a block of 6 I bought off Dennis from here, they have undergone a full refurb, so can clean and use easily and now train 6 with minimum fuss!! RayC wrote: sorry to deflect from topic, but what kind of show cage is that? Surprised at you Ray, did you not see them at the ACS. The guy was selling I think Satinettes out of them. BlueCobalt wrote: Got a few Lipochromes this year that appear quite large, will have to wait and see for the colour! But hopeful it will show through, just thought you maybe interested to see how they look in a showcage!! This one maybe too big lol! Very Big Simon 5 7/8" ???. Could be nice stock bird if it carrys the colour through. Measure again! 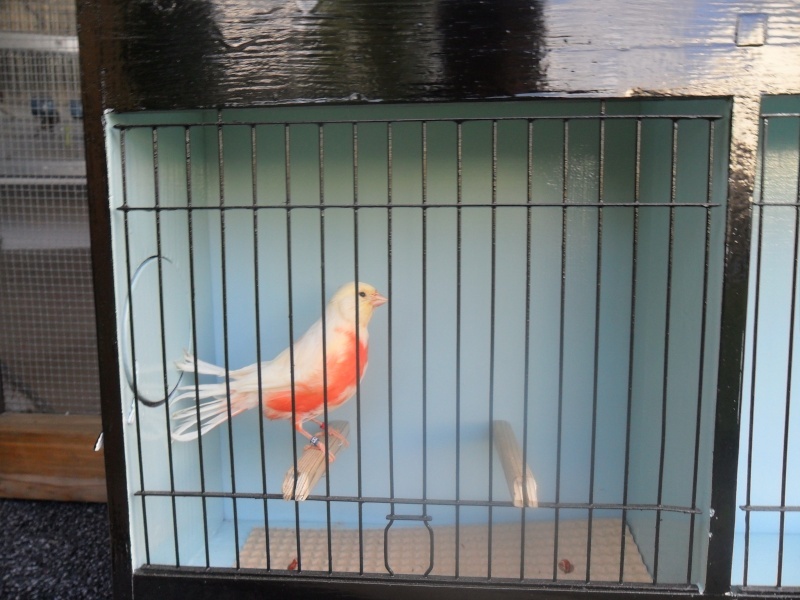 LOL its tail does actually touch the end of cage, but yes agree stock bird, its intensive also.